The Remington ThunderCeptor is the Flagship of the Remington range of air rifles, with a powerful gas ram system at its core. The Gas ram has several advantages over the traditional spring, the main one being that the gas ram doesn't lose power over time like a spring rifle does with spring fatigue. Another is that as the Gas ram is a sealed unit, the shot to shot consistency is much better. The stock is constructed from a hard wearing black polymer, with stippling to the fore end and grip for a strong and positive hold. As well as this, the barrel is shrouded to reduce the muzzle report, making this your first choice for pest control, and hunting. 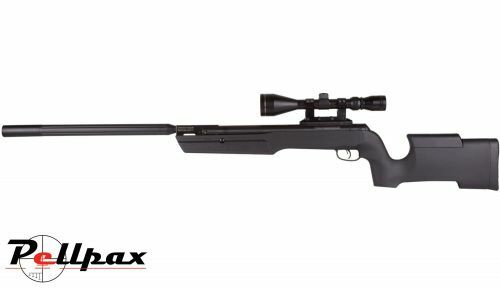 Included with the air rifle is a 3-9x50 scope and mounts, so all you need to do is add pellets, and start shooting!